*Edit: We're having some technical difficulties, link up here for now and I will see if we can get it fixed and on the other blog in the meantime! 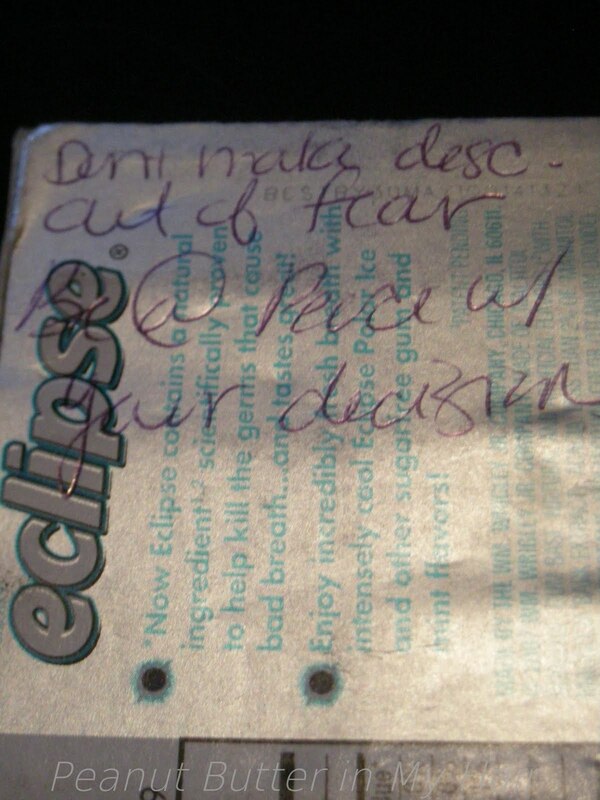 Don't make decisions out of fear. Be at peace with your decisions. It's been floating around in my purse, my heart and my mind for weeks. Three little worlds swirling around in the bottom of a dirty purse. Swirling around a heavy heart ad a busy mind. Swirling by amazingly (seriously you should see my purse and my brain!) never lost. There is so much to be scared of these days isn't there? Spend an hour with the news or a neurotic friend and you will have a long list of things to start to worry and fear. Fear is easy, much like discontent it's easier to let the fear fill our minds and hearts with it's uncomfortable weight than to do the heavy lifting necessary to push it out of the way and see the blessings that surround us. I know that fear is the easy way out, having the faith to know that he is with me and I don't need to be afraid, that takes work, discipline. It's not easy, but I know what I can do and how to do it. It doesn't always work, fear is tricky, but I have methods and solutions. Fear is not what struck me in Father Sam's quote. It was the "be at peace with your decisions". As parents we make hundreds (thousands?) of decisions big and small in a day. I would say that for most of my decisions fear doesn't play into. I over think, research, think some more, weigh the pros and cons, ponder some more and then make a decision. You would think after all that I would have peace of mind right? No. I second guess. All. The. Time. Most of the time there is nothing I can do about it. It's just one more thing to fret and worry over. One more thing weighing on my chest and taking my peace away. It's silly really. Why not be at peace with my decisions? If I took my time and thought it through, didn't make a rash decision based in fear but followed my heart and head shouldn't I be at peace? Shouldn't I believe He guided me to that decision? It's time to get over it. I don't make decisions based on fear so I should learn to trust in myself and be at peace with what they are and where they take me. I would say that maybe we second guess ourselves for fear of what others might think if we're wrong. And that happens sometimes. But most often, I think we second guess ourselves because we're the ones judging ourselves and finding all the ways we fall short (in hindsight - even though we do the best with what we know at the time). We remember so clearly every time we make a wrong decision. We forget so easily all the millions of right and good decisions we make. Maybe what we really need to do is find more compassion - for ourselves. I struggle with making decisions too. Sometimes they paralyze me. It's definitely become harder with children. My issue is fear of consequences and what actions will lead to what. But I also think it has to do with burnout - being responsible for making too many decisions. I'm trying to battle it by having my husband make more of the decisions related to our family. I don't need to be the one who holds all the pressure, so I'm letting some go. So often I will fear as I consider what I'm planning to do ... and it's so not the right way to go about making decisions! That's where, for me, living by the Spirit is so helpful. When I'm walking by the Spirit, I don't get those gut-wrenching fear spells. I love this as well. 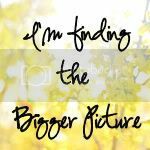 Decisions can be the hardest part of being a parent, I think it is because we become acutely aware that our decisions affect not just us, but those we love the most and so we begin to wonder 'what if...'. Descisions are hard, and they seem endless sometimes. There are worries for each hour, day, week, month, year, person, holiday, action and on and on! I love the Bible verse where Jesus says "which of you, can by worrying add one year to his life? (or one inch to his stature depending on your translation.)" your priest is wise. what's done is done. sometimes we choose wrong, but God can order good even out of missteps.